Quick Guides & Videos: Always online right here! Just search for your product at the top of the page to access product training in both PDF and video formats. Recorded Webinars: Watch a training session any time that works for you. Weekly Webinars: Learn the ins and outs of your solution and ask our product training experts questions. Just choose a scheduled class from the Monster Course Library. Recruiter & Customized Solution Training: Live events for your recruiters tailored to your business – get product training, recruiting tips, best practices and industry knowledge. 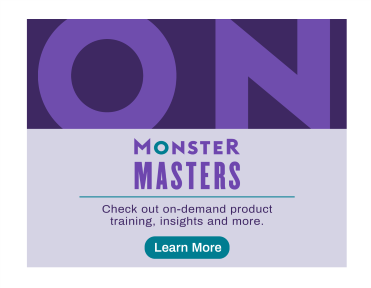 Learn how you can get the most out of your Monster solutions, sign up for live trainings and check out all the resources that are just a click away. You can also use the search bar above to zero in on quick guides, how-to videos, and more. Check out all the products in the Monster lineup and access training on everything from set up to success. Find out how to reach and engage the best candidates, wherever they are – and learn how to build a better job ad. Learn how you can use our powerful search solutions to zero in on the best candidate for the job. Check out all the training offerings we have available to you and your team. See how you can manage your account preferences and access reports to stay on top of usage and more. We’re here for you. Access our help tools or get in contact with one of our customer service representatives. A fast approach to getting to know your Monster solutions, quick guides will get you up and running in no time.